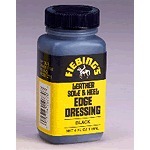 Fiebing's Sole and Heel Edge Polish. Attached Dauber polishes and restores scuffed heels and sole edges. Gives Edges a lustrous finish.